We have a four-day weekend coming up for the Easter holiday, and I’m using it to do something I’ve never done before — make a solo trip to Beijing. I am staying by a friend who lives there, but will have to go sightseeing by myself while she goes to work. I’ve never travelled alone and am sort of looking forward to it; not because I am anti-social, but because I’ve never taken a holiday by myself and it might be fun and challenging. I figure I’ll enjoy the freedom of sightseeing by myself, but may also meet some nice people who will invite me out. I’m really looking forward to seeing the Forbidden City, the Temple of Heaven, the Summer Palace, and of course the old wooden Chinese hutongs before they tear them all down for the Beijing Olympics. 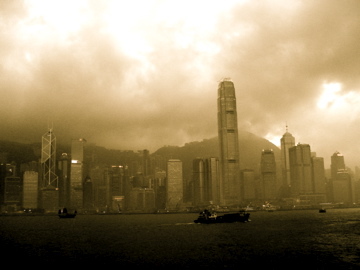 In the meantime, here is a picture of Hong Kong’s beautiful skyline on a cloudy day. The picture was taken from across Victoria Harbour, at the Tsim Sha Tsui observation deck. There really are days when this is an amazingly beautiful city.